It's taken me years to finally come to terms with this. 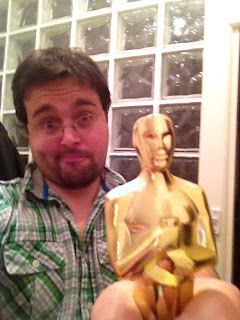 I am never going to win Best Original Screenplay and Best Supporting Actor at the same ceremony (I'm not arrogant enough to think I could be a leading man; the quirky friend or sadistic German adversary, perhaps). I will never get to go up on the stage at the Dolby Theatre to tearfully thank my peers, clad in chic Gaultier (a black tuxedo with daring accessories to make me just that little bit more interesting). I'd accept Best Screenplay gracefully from an admiring Jodie Foster (we'll become best friends backstage, though she'll be secretly jealous). I'd get Best Supporting Actor from a clearly awestruck Helen Mirren. I'd field questions from the press, halting the conference so we could have a moment of dignified silence during the In Memoriam montage, because I'm just that classy. Then I'd go to Elton John's Party, where Adele and I would perform a drunken duet of Skyfall while taunting Peter O'Toole with our statuettes ("fifty years as a cinematic great and you can't even scrape a single competitive award? LOSER!"). Something like that. I haven't really put any thought into it. I realised that as I'm 36 and living in the North of England - and I haven't written any screenplays or done any acting either (technicality) - I will not attract the attention of the Academy, so my chances of rubbing shoulders with Brad and Angelina next February are pretty slim. 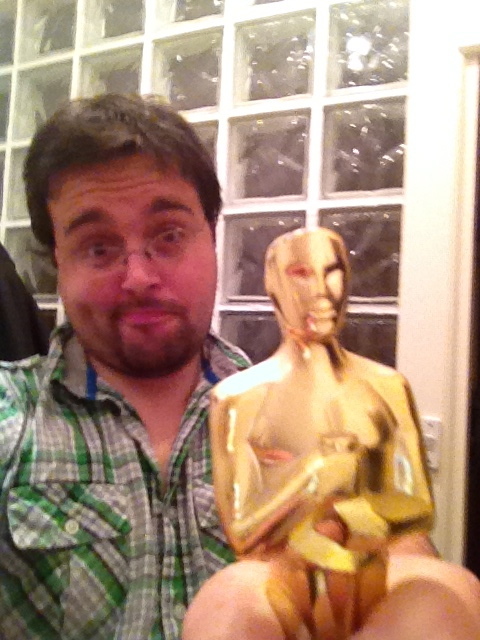 I know what you're thinking: there are BAFTAs! Screen Actors Guild awards! MTV Awards! The Nobel Prize for Literature! 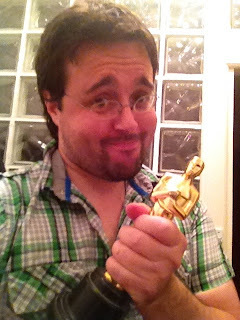 But no: these awards would just be second best, hollow gestures that wouldn't satisfy my Oscar shaped hole. I dismantled my trophy shelf, threw away my life sized standee of Billy Crystal, turned my tux into dishcloths. I would never receive the undeserved love of random strangers personified in a piece of hollow perspex. 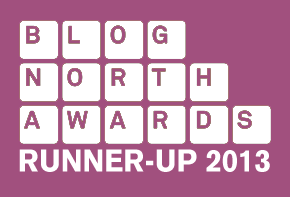 This afternoon, I received notice that I'd been nominated for a Blog North Award. An actual award nomination for an actual award that is clearly more than equal to the Oscars. Perhaps even better, because I bet the Blog North People wouldn't ask James Franco to host. I'm one of five finalists in the category of Best Personal Blog, which is clearly the Blog North equivalent of "Best Picture". There are some other categories as well, but I'm not in any of them, so I haven't really noticed what they're about. I'm touched, flattered, astonished and very competitive about it. I'm trying not to be because there's only a one in five chance of me winning anything - actually less than that; I've read some of my competitors and I'm feeling a bit like any actress who sees she's up against Meryl - but that deeply unpleasant part of me would really like to win. That would be very kind of you and I'd be very grateful. The closing date for voting is October 1st, so best not put it off or anything. I promise if I win I won't do the full Halle Berry; maybe just a bit of a Gwyneth, but the pink frock will look much better on me. Thank you again. Of course, if you don't want to vote for me, that's fine too, and as soon as I find some IP blocking software I'll let you know that I appreciate your honesty. (But really, I am very very chuffed right now. Stupidly so. I'm grinning as I type. You like me! You really like me!). P.S. If Barbara Broccoli or Michael G Wilson are reading this, I am TOTALLY up for writing a Bond film. Despite my lack of screenwriting experience. I'll even play the villain for free. Call me! And my mum voted too, so that's five!